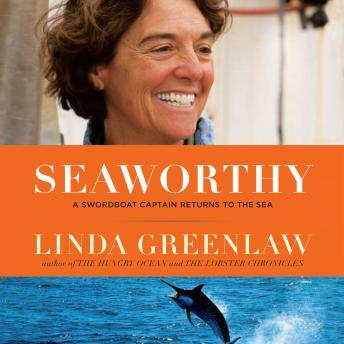 Linda Greenlaw hadn't been blue-water fishing for ten years, since the great events chronicled in The Perfect Storm and The Hungry Ocean, when an old friend offered her the captaincy on his boat, Seahawk, for a season of swordfishing. She took the bait, of course, and thus opened a new chapter in a life that had already seen enough adventure for three lifetimes. The Seahawk turns out to be the rustiest of buckets, with sprung, busted, and ancient equipment guaranteed to fail at any critical moment. Life is never dull out on the Grand Banks, and no one is better at capturing the flavor and details of the wild ride that is swordfishing, from the technical complexities of longline fishing and the nuances of reading the weather and waves to the sheer beauty of the open water. The trip is full of surprises, "a bit hardier and saltier than I had hoped for," but none more unexpected than when the boat's lines inadvertently drift across the Canadian border and she lands in jail. Seaworthy is about nature - human and other; about learning what you can control and what you do when fate takes matters out of your control. It's about how a middle-aged woman who sets a high bar for herself copes with challenge and change and frustration, about the struggle to succeed or fail on your own terms, and above all, about learning how to find your true self when you're caught between land and sea.